For the look I created for you all, I started with a base of Essie Serial Shopper. 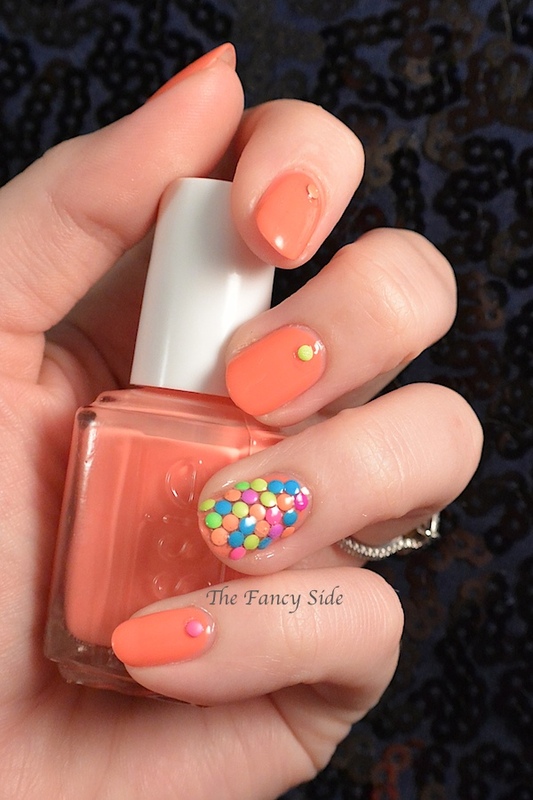 This polish is from the new Too Taboo Collection, Essie's Summer Neon collection. It's not as eye-searingly neon as I had hoped, more just a bright polish. 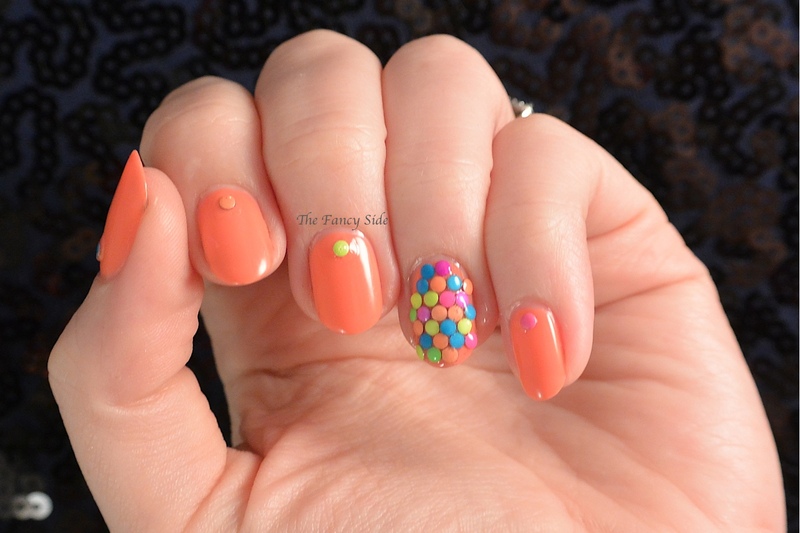 It has a thick jelly base and it took 4 coats to get the opacity you see in the pictures. After letting my base dry, I channelled the glitter placement queen, Polish All the Nails, because I recently saw her do a mani with neon studs that was amazing. I differ in that I used round studs and didn't do all my nails, I just wanted an accent nail. As you can see, I wasn't to picky about which color stud went next to which. I just wanted the whole nail covered. This was a super fun look, and I got tons of compliments on it. I hope you all enjoyed the design I created for you. It sure was fun for me to do. Katherine, thanks for having me! Come visit me sometime! You can find me at The Fancy Side, Instagram @Fancysidenails, Twitter @fancysidenails, or Facebook! What a nice guest post! 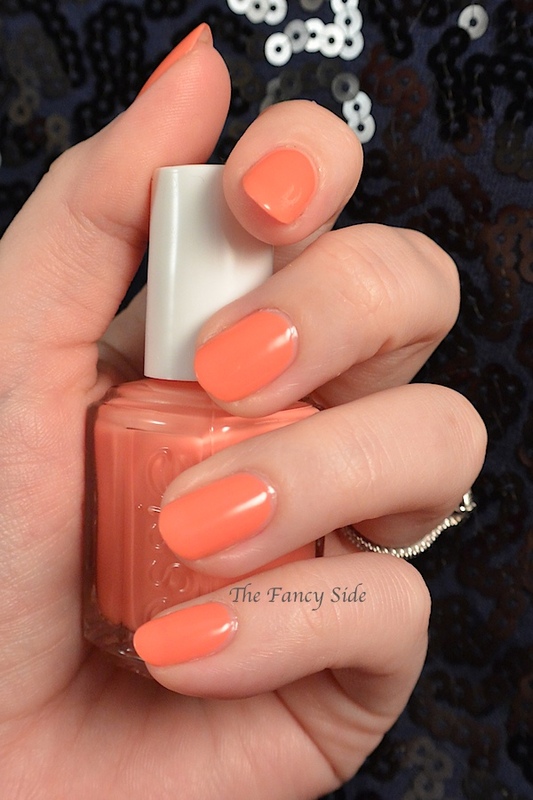 That is such a pretty peachy shade from Essie. The studs you added are such a fun touch. It kind of reminds me of candy. Thanks! I agree, it is very Candy-esque. I loved this look that I did for Katherine. It really pushed me out of my box.